Holmes defended his title against contenders of varying quality, many quite good--Tim Witherspoon, Earnie Shavers, Bonecrusher Smith, Leon Spinks, Gerry Cooney and Mike Weaver--but the most emotional night of his reign came when he faced his friend, the legendary Muhammad Ali (October 1980), who was returning to the ring in an attempt to win the heavyweight title for an unprecedented fourth time. Although looking fit and trim (Ali weighed 217 1/2 pounds, his lowest weight since his title-winning fight against George Foreman, when he weighed 216 1/2 pounds), Ali was on medication for a wrongly diagnosed thyroid condition and was unable to recover his former skills or stamina. Holmes dominated the fight (arguably without looking to land a killer blow) until Ali's trainer, Angelo Dundee, finally retired his fighter after the 10th round, giving Holmes a win by TKO (the only nondecision loss of Ali's career). 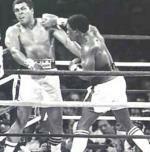 1980 Larry Holmes -- all right, Ali lost by a TKO. But the fight was very competitive and I had the fight scored 5-5. Had it gone the distance (and had Angelo Dundee not been racist towards Bundini Brown who wanted the fight to continue beyond the 10th round), it could have gone either way. And Ali was badly weakened by taking thyroid medication, so the Holmes win here is tainted in my opinion. 1981 Trevor Berbick -- Ali redeemed himself from the Holmes debacle by clearly outboxing his much younger opponent, but the corrupt judges saw to it to put an end to Ali's career. 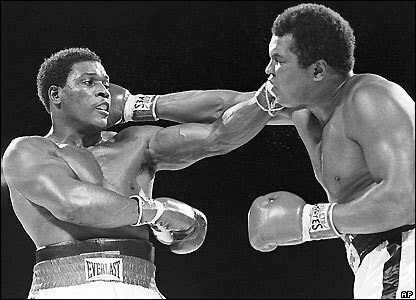 If Ali had won (which he should have), he would have fought Mike Weaver in 1982 for the WBA heavyweight title, and after winning that, he could have earned a much-deserved rematch with Holmes later that year, and he would have a very good chance of winning.